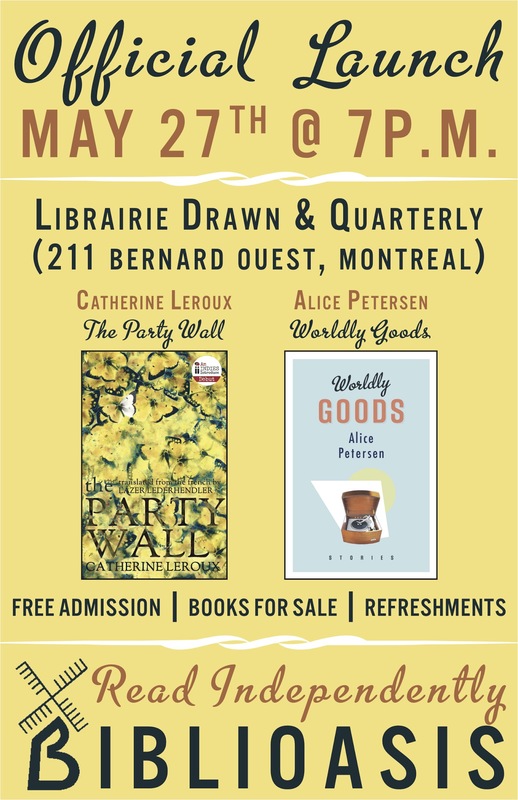 211 Bernard: Tonight at 7:00 p.m: Biblioasis double launch with Catherine Leroux and Alice Petersen! Tonight at 7:00 p.m: Biblioasis double launch with Catherine Leroux and Alice Petersen! Join us as we host Catherine Leroux and Alice Petersen for the launch of two new Biblioasis books this May. Catherine Leroux's LE MUR MITOYEN, winner of the France-Quebec Prize and the Quebec Bookseller's Prize, is now translated into English as THE PARTY WALL. Alice Petersen's new collection of short fiction is WORDLY GOODS, following up on the success of ALL THE VOICES CRY, which won the Quebec Writers’ Federation Concordia University First Book Prize. Catherine lives and writes in Montreal, and Alice lives in Chelsea, QC. Refreshments and conversation will be flowing.